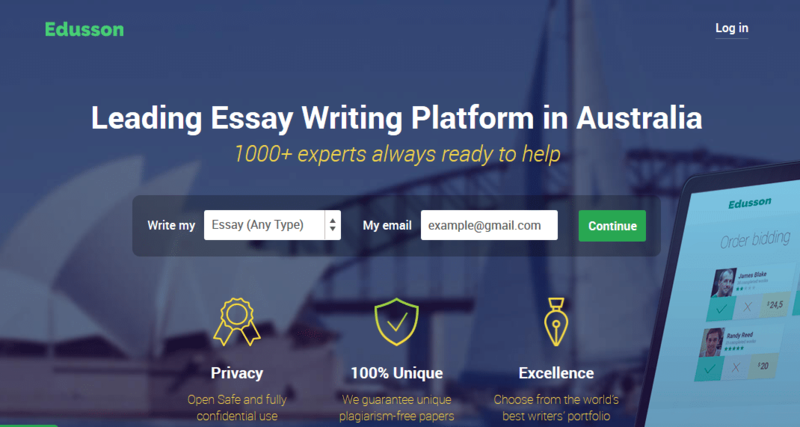 Au.Edusson.com is both writing and tutoring service that works quite differently than other services we review. According to the company’s website, they hire only qualified experts who freelance from all around the world. Do they manage to provide customers with good service? Read on. When you look at the website, you will find it to be very interesting in design. However, when it comes to services, the description is more than just vague. We have found statements such as ‘the services provided are meant to assist in providing a guideline’. What does this really mean? The company works by providing writings from scratch and proofreading and gives customers the opportunity of choosing their own writer from those who apply to their project. There is a page that lists all freelancers, their ratings and portfolios. However, the whole process takes much more time than students usually have since you need to wait for writers to apply to your request and pick the one you find most suitable. Also, there is also the time you need to spend looking into writers’ profiles. There is no such thing as prices on the website. Apparently, you choose the price with the writer, but it must start from the minimum quote the company has set and that is $7.5 per page. The minimum quote is one of the lowest we have seen, but no great writer approaches you with such offer. As there are no prices, there are no discounts either. On what price would they base a discount? Even if you are a returning customer, you are still agreeing on the price with your writer. At the end, the price you get is going to be a result of your persuasion skills and the minimum rate a writer is willing to write your paper for. It is difficult to say what a paper would cost you, which makes it difficult to set an opinion of the quality of content. The feedback we have found is so varied that we cannot make a real estimate. What we know is that it all depends on your choice of writer. Of course, the best writers come with the highest prices, which make the service less than affordable when compared to those with fixed prices. If you are ready to try out a new method of ordering your assignment, this is one place to turn to. It is always nice to have the upper hand of choosing who will work on your paper, but can you be sure that your writer will provide you with quality content? the portfolios for the company’s writers are fake. I have made a purchase from one of the best writers and got a bad paper. I did not like that they did not have discounts, but I still went for the service because of the chance to choose my writer. Maybe this was my experience, but the paper I got was of terrible quality!